However, there are a number of things to think about before you go ahead and book to make your ski trip as stress free as possible. Some ski resorts are better suited to families than others. If it is yours or your children’s first time on skis then you should look for a resort which have dedicated beginner skiing areas. So you should do your research before you go or check out a website dedicated to family travel for some tips of the best resorts. You should be looking for family friendly accommodation, child-friendly ski areas, children’s ski school and childcare facilities and suitable children’s activities both on and off the snow. Skiing offers all different kinds of accommodation options which are all suitable for families in different ways. You can book the exclusive use of a chalet, which is a great options for families with younger children as often these chalets will serve a high tea for the kids early in the evening, you can then put them to bed and have an adult only dinner. If you prefer to eat as a family then in an exclusive use chalet of course that option is also available. Check carefully what facilities a chalet has. Again many will have baby items for your use, in-house childcare, games room or even children’s entertainers. The better the range of facilities the chalet can offer the less baggage you will need to take and the more stress free the holiday! An exclusive use chalet is excellent for larger families, a number of families travelling together or a multi-generational ski holiday. You can stay in a chalet sharing with other holiday makers. This is a very social holiday where you will dine with the other chalet guests in an evening and would be good if there were other children staying at the chalet for yours to make friends with. It is worth checking before you book though the make up of the other guests who have already booked for the week you are going. If it is a group of young people then that might not be the best combination if you are travelling as a family. You can stay in a hotel, which is a good option if your kids are a bit older or even teenagers as this gives everyone their own space in their own rooms. Again check the hotel’s facilities carefully to ensure there are interconnecting room (if you require that), cots, high chairs etc. There is a whole range of price options from the budget end to the five star hotel or luxury chalet. If you have young children look for somewhere which is not a long flight time and there is a short transfer time to your accommodation when you get there. All parents know how tiring it can be to travel with kids and how irritable children can get if they are bored – which makes it harder for parent too. The majority of resorts offer a dedicated children’s ski school with qualified instructors experienced in teaching children. Ski school normally accepts children from the age of 4. Some resorts offer a skiing kindergarten for children as young as 3 where children are encouraged to have fun and play in the snow rather than formal lessons. 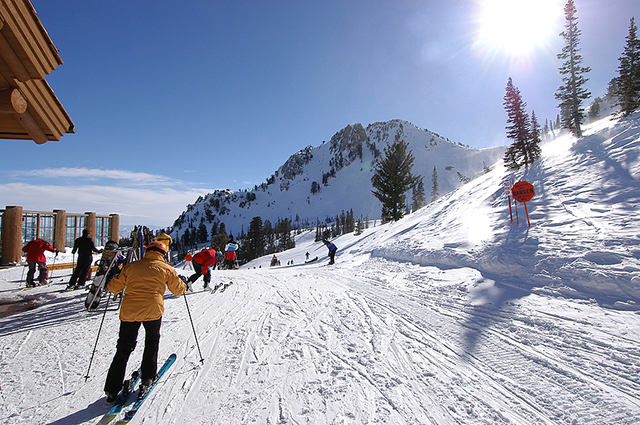 There is usually a dedicated children’s ski area with special mini-lifts and outdoor games. Any children under that age would need childcare. Again most resorts have excellent childcare options and some luxury chalets will include this as part of the exclusive use package or can arrange in chalet childcare at an additional cost. You should arrange this before you get to your destination as places fill up quickly. It is becoming more widely accepted now that you should wear a helmet skiing and for children this is obviously equally as important. Your child will also need good goggles to prevent snow blindness and a very high factor sunscreen – it is very easy to burn due to the suns rays being reflected. Also of course you should ensure your child has lots of thin warm layers so they can easily be removed or added to keep them warm and dry. Everything you need as a parent to go skiing your kids obviously need too. So skis, poles, goggles, glasses, helmets, salopettes, jackets, thermals, gloves, sunblock… the list is endless. So expect to have a lot of luggage. Even if you are planning to rent equipment while you get to your destination this is usually only skis and boots. There is then an obvious cost implication! Once you have considered all of the above then you are ready! Enjoy your first ski trip en-famille!